A graduate of the Jagiellonian University Collegium Medicum in Krakow, he graduated with honors from the medical school. He gained his professional experience in the best hospitals in Poland and abroad. 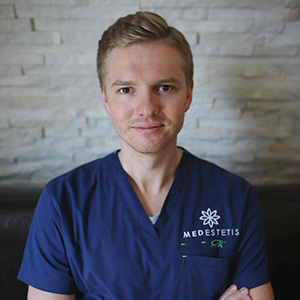 He completed clinical internships in the USA (University of Rochester Medical Center, Strong Memorial Hospital in Rochester, NY, USA), Germany (Technische Universität München, Klinikum Recht der Isar and Klinik Und Poliklinik Für Innere Medizin in Grefiswald), Sweden (Karolinska Institutet) and Italy (Universita degli studi di Cagliari). Currently he is in the course of specialization in general surgery at the Hospital of the Order of the Bonifratri in Krakow. He has been dealing with anti-aging medicine since he graduated. He participated in numerous specialist courses in the field of aesthetic medicine, he completed post-graduate studies “Cosmetology and aesthetic medicine for doctors” at KWSPZ. He completed a 4-month internship at one of the renowned aesthetic medicine and plastic surgery clinics in Poland. Author of many scientific publications in the fields of both conservative and surgical medicine in renowned international medical journals. PhD student at the Medical Faculty of Collegium Medicum at the Jagiellonian University. I value the relationship that I am trying to build with each patient. At the same time I lay emphasis on the highest quality of service, professionalism but also a light, friendly atmosphere. I am very satisfied with the smile of patients, their gratitude and satisfaction with the treatments.. Because health is not just a lack of disease. The feeling of health is also influenced by satisfaction with your own body and a smile on your face when you look at yourself in the mirror. Privately ski instructor PZN, passionate about tennis, good design and modern architecture. Music lover.